For the first time ever, here's a resume book that clears away the clutter and gets down to the brass tacks of what it takes to write and design a resume that will get you interviews and job offers. 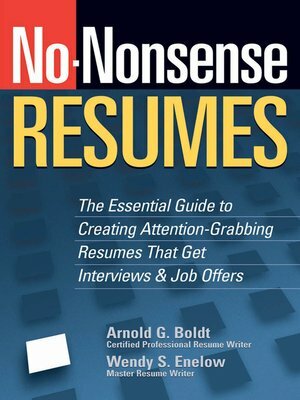 Authors and professional resume writers Wendy Enelow and Arnold Boldt share their insights, knowledge and more than 35 years of combined experience to help you prepare a resume that will get you noticed, not passed over. Subsequent chapters offer specific tips on creating winning resumes for job opportunities in virtually every profession: Administration & Clerical; Accounting, Banking & Finance; Government; Health Care & Social Services; Hospitality Management & Food Service; Human Resources & Training; Law Enforcement & Legal; Manufacturing & Operations; Sales, Marketing & Customer Service; Skilled Trades; and Technology, Science & Engineering. Included in each chapter are sample resumes contributed by leading resume writers and career consultants worldwide.